Suggestion box for Boston’s citywide planning process. 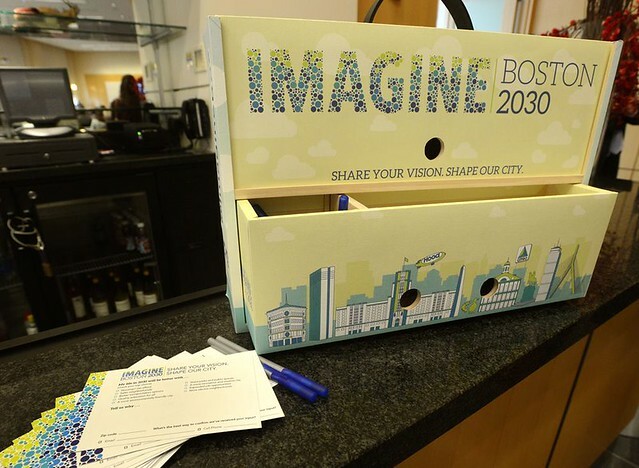 Photo Credit: Imagine Boston 2030. Since September 2015, I’ve been working as the Climate Preparedness Fellow for the City of Boston Office of Environment, Energy, and Open Space. I am in a new position tasked with focusing on how the city understands and prepares for the impacts it will face as a result of long-term climate change. There are many directions that this work takes, and many questions it raises. How do you protect buildings and infrastructure from flood damage, and whose responsibility is it to pay for these investments? Can the need for adaptation—which means climate change is here and happening—motivate deeper mitigation action, because we realize that without it long term adaptation may not be possible? What does it mean to reduce social vulnerability to climate change? And how do you engage people in an issue that may feel far-off, when they are facing daily emergencies? These are questions I thought a lot about in writing my thesis at the Department of Urban Studies and Planning at MIT this time last year. I focused specifically on how resource-constrained cities can better integrate these two seemingly different planning processes: expanding their efforts to both prevent climate change and reducing unavoidable impacts. There are interventions cities can focus on that address both mitigation and adaptation: increasing renewable, efficient, and distributed energy; protecting green space; and strengthening public transit. These strategies can all reduce demand and dependence on vulnerable and fossil-fuel based systems, leading to more sustainable adaptation strategies. Prioritizing these investments in underserved communities, can also achieve critical public health and equity goals. Crucial to this work is also the question of how climate change planning can move from a narrow focus on carbon emissions and disaster preparedness to a more comprehensive approach to building community resilience. This question is key, if climate action is going to better align with community priorities and achieve more equitable outcomes. But it is difficult to tackle, especially within the traditional siloes and jurisdictions of city government. Currently in the City of Boston, there are three major initiatives that could begin to impact climate change planning. I am working on a new initiative called Climate Ready Boston which will identify the climate impacts that the city will face. Focused on Boston’s vulnerable communities, infrastructure, natural systems, and built environment, this initiative investigates potential resiliency strategies to advance local and regional adaptation. I am also working with the City’s Chief Resilience Officer on her “Resilience Strategy” that examines how the chronic stressors that communities face (e.g. poverty, lack of social cohesion, affordable housing, aging infrastructure, and displacement) impact their ability to recover from acute shocks related to climate change and other hazards. Finally, the City is also undertaking its first master planning effort in 50 years—Imagine Boston 2030— in which climate adaptation and equity are two major pillars. It is through the alignment of these efforts that I hope to tackle the central issue that I grappled with in my thesis, and continue to explore in my work: how climate change planning can more centrally and comprehensively address sustainable development and social equity in cities. Post by Mia Goldwasser. She is a Climate Preparedness Fellow for the City of Boston Office of Environment, Energy and Open Space. To discuss other local advocacy and community-building efforts around climate mitigation and clean energy happening around the US join #citychat on Thursday February 25th, 3pm EST. See more information here.